Among videos and images of the protests, France3 featured a photo supplied by Agence France Presse (AFP). It shows a couple of mounted police officers watching the crowds outside the Opera building in Paris on Saturday. 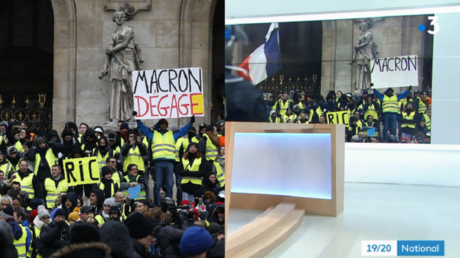 One of the Yellow Vests holds high a placard, reading “Macron out.” Here’s this photo. Everything was the same in the France3 broadcast, except for a ‘tiny’ detail – the “out” part of the slogan had mysteriously vanished from the image. It remains unclear how, exactly, one can doctor a picture in such fashion by “mistake.” Aside from the uproar and accusations of Orwellian-grade censorship, the blunder triggered a wave of jokes. Others suggested who might have been responsible for such an unfortunate “mistake.” Some jokingly suggested that Alexandre Benalla, the embattled former security aide to Macron, might have had his hand in it. Benalla has been involved in several high-profile scandals. Namely, he was caught on tape getting up-close and personal with protesters earlier this year. Macron’s aide was “helping” police to beat them … while sporting borrowed police gear himself.